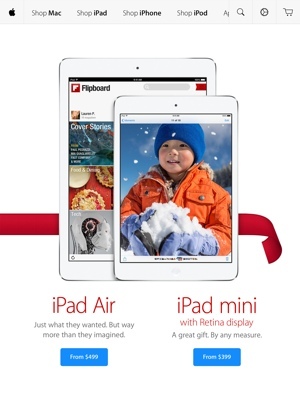 Just in time for the holidays, Apple has launched its first ever dedicated Apple Store app for the iPad tablet. The new app is simple and intuitive, taking advantage of the iPad's unique size and configuration. You’ll find a menu at the top of the screen to help you navigate around the store; it hides when not in use. Product photos are crisp, clear and in high-resolution – you can pinch to zoom in extra close without losing any detail. There are plenty of angled view shots to swipe through, too, even for accessories. Aside from the beautiful layout and design, the greatest feature of the new Apple Store iPad app is the product information hiding within. Each decision comes with its own out-of-the-way information pane, helping you decide between processors, RAM, storage, phone carriers and other options. It's like having a non-intrusive Apple employee on hand to explain your choices. Black Friday is just around the corner, and if this year is anything like last, Apple will be offering one-day-only discounts on its most popular products. Thankfully, with the new Apple Store app, you’ll be able to skip the nasty in-store lines and order right from the comfort of your own home. Shipping is free on Apple Store orders over $50. The new Apple Store iPad app is a free download via the Apple App Store.